Kleefeld on Comics: Happy Birthday, Tom! 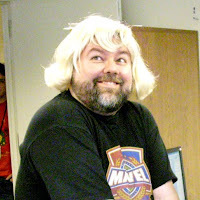 Happy birthday wishes go out today to Marvel editor and all-around swell guy Tom Brevoort! Have I mentioned lately that he generously wrote the Foreword to my book? "Oh, nice one, Sean! Turn a sincere birthday wish into some shameless plug for your stupid little book that no one wants to read anyway! Real classy!" What? It's not like Tom follows my blog anyway? Plus, he's going to get, like, a million well-wishers today; there's no way he's even going to bother to read this. So I figure I may as well get some mileage out of it! Wait -- what do you mean no one wants to read my book? "Come on! How many have you sold that weren't bought by your mom? I'm sure she told you it was very nice and has it up on the refrigerator, but name one other person who bought one." That's not fair! You know I don't see the names of who actually buys them. And some people have said some very nice things about it! Well, my friend Dave said it was compelling and enjoyable. OK, well, this Daniel Peretti guy said he was going to quote parts of it in his book. "A book that he hasn't published yet?" Well, Laura Hale has been linking to a lot of it from various places. "And how many sales has that generated?" I can't tell that! *snif* It's a good book... *snif* I worked really, really, really hard on it! *snifsnif* You're just jealous 'cuz you didn't write it! You're just a big ol' meanie! *snif* I'm gonna go tell! DAAAAAAD! "Hmph. Idiot! Of course no one's buying it; he put the whole damn thing online! And then he tries to muck up Tom's birthday with this shameless crap? Disgraceful!" Maybe you should frame your book that the more technology enables access, the more anywhere and anything becomes the foundation of art. I don't here anyone else saying that, much less gone into the practices evolved to indulge in this situation.